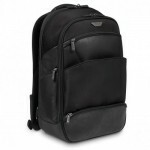 The ultimate classic professional range, Mobile VIP combines premium styling with superior protection for your laptop. Featuring an innovative Multi-Fit cradle in the laptop compartment, which can securely accommodate a range of different sized hardware, this backpack is designed to carry and protect laptops between 12 and 15.6â€ with a reassuringly snug fit. Offering superior protection, the SafePortÂ® Sling Suspension system suspends your laptop in case it is dropped. From contoured shoulder straps and back padding, to a weather resistant base, this laptop backpack features outstanding attention to detail. Additional waterproof pocket in the base enables you to quickly and easily store gym kit, chargers or an extra pair of shoes, perfect for professionals on the go.